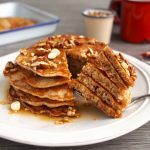 These nutty nut pancakes are made with whole wheat flour and three types of nuts to give each bite a crunch. Enjoy the extra protein, vitamins and minerals you get from adding nuts to pancakes! In a medium bowl, mix together the whole wheat flour, sugar, baking powder and salt. In a separate bowl, beat together the egg yolks, milk, butter and vanilla extract. Pour the egg yolk mixture into the dry mixture, and mix until well incorporated. Mix in the chopped nuts. In a separate bowl, beat the egg whites using an electric mixer on medium-low speed until soft peaks form. For the soft peak stage, when you lift up the beaters, the egg whites should hold their peaks just for a second or so before falling back into themselves. Fold the egg whites into the batter, being careful not to over mix. It is okay if there are chunks of egg white foam in the batter. Heat an electric griddle to 375°F / 190°C. Add on a little bit of butter to coat the pan. Drop on the pancake batter 1/3 cup at a time. When you see bubbles start to cover the surface of the pancake, gently lift up to check the bottom of the pancake to see if it is golden brown and crispy on the edges. When it is ready, flip the pancake over and continue cooking the pancake until it is golden brown on both sides. Repeat with the remaining batter, cooking as many pancakes as you can at once. Serve topped with extra nuts and drizzled in warmed maple syrup (heat maple syrup in a microwavable container for about 10 seconds in the microwave). Recipe adapted from the Clinton Street Baking Company Cookbook, as published on Verily. Get this recipe for Nutty Nut Pancakes at https://www.theworktop.com/breakfast-brunch-recipes/nutty-nut-pancakes/.